executive Engineer jobs through online mode only. The educational qualification for the Executive Engineer Jobs is candidates should have completed the Bachelor’s Degree in Electrical Engineering/ Technology and having minimum 3 years of experience in power sector. 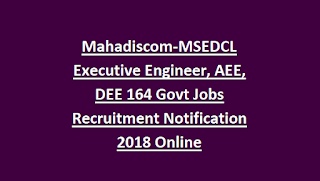 Interested and eligible candidates can apply for Executive Engineer, AEE and DEE jobs through online official website of MSEDCL is www.mahadiscom.in. The online application forms will starts from 16-10-2018 onwards. The last date to submit the application form along with the necessary document is on or before 06-11-2018. For more information of age limit, available vacancies, salary, application fee, selection process, exam patter and syllabus are given below. The upper age limit for the candidates is for Executive Engineer (Dist.) and Additional Executive Engineer (Dist.) Posts is 40 years and for Deputy Executive Engineer (Dist.) Posts is 35 years. For Executive Engineer jobs candidates should have 9 years Post Qualification experience in power sector in the at least 5 years in the area of power distribution as AEE and DEE or 2 years as AEE. The written exam paper will comprising of Objective Multiple choice questions of total 130 questions for 15 marks with duration of 120 minutes. 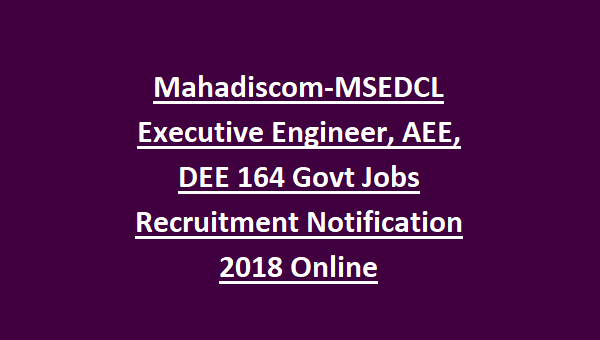 Interested and eligible candidates can apply for Executive Engineer, AEE and DEE jobs through online official website of MSEDCL is www.mahadiscom.in. The online application forms will starts from 16-10-2018 onwards. The last date to submit the application form along with the necessary documents is on or before 06-11-2018.